Hey guys, as you might already know, I went to Paris for my 21st birthday. I went there for three days and had an amazing time. All of my family flew over to see me, along with my best friend (whose birthday was the day after mine), her sister and two of my friends who are living in France with me. I got loads of presents and got to see loads of the sights in Paris. I absolutely hate walking around looking for things, so we made sure to get the Hop On Hop Off Bus that takes you all around Paris to all the major tourist sites. This bus would stop at each site so you could choose if you wanted to get off or go to the next one. If you did get off, you could do whatever you wanted there and you could get back on another Hop On Hop Off Bus whenever you were done there because a new bus would come every ten minutes or so. On this bus, we saw lots of different famous tourist attractions in Paris, including the Arc de Triomphe, the Louvre, the Champs Elysees and the Eiffel Tower. 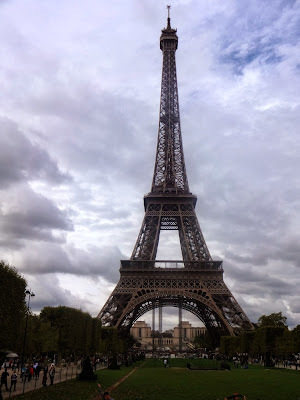 When we got to the Eiffel Tower, we got of the bus and queued up to go to the top of it. I didn’t really like the look of the Eiffel Tower up close; it was a bit of an eye-sore and was actually brown instead of grey which it appears to be from far away. We queued for ages to get to the top and there was a great view from there but then we had to queue for ages again to get back down. It took over three hours overall to get to the top of it and get back down again. I know a lot of people love the Eiffel Tower but I thought that it was a bit overrated. Some of my friends, however, went a while after me and they didn’t have to wait three hours. They said that the wait was fairly okay, but the couples who were all over each other on the way to the top, standing beside them, were really annoying. This was something I noticed a lot in Paris. The couples were all over each other all the time. They say that Paris is the city of love but I felt more like it was the city of PDA. Couples were kissing and cuddling everywhere you looked. There was one thing I saw that was really weird; a guy was cradling a girl like she was a baby, swinging her to and fro for about five minutes with his hand on her arse and I couldn’t believe it. It was just such a random thing to do. One of my favourite things that we did in Paris was our trip to the Zoo. There was loads of really cool animals there but my two favourites were the crocodile and the snow leopard. The snow leopard was so cool, he keep walking back and forth at the front of the enclosure like he was showing off for all the people watching him, whereas all the other large cat animals were far at the back lying down in their enclosures. He was my overall favourite animal there and had the coolest tail ever; it was so fluffy. 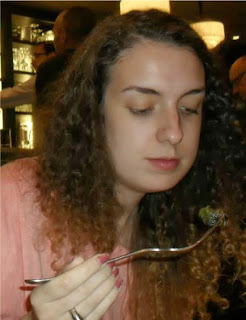 One cool thing that I got to do on my last day in Paris was to try some snails. People always say that the french eat snails and frog’s legs and I’ve always wondered what they would taste like. Unfortunately, I couldn’t find a restaurant that did frog’s leg so I guess I’ll do that another time, but I got to order a starter of large burgundy snails in a restaurant in Montmartre. I tried them and they were nice enough but it was kind of funny trying to get them out of their shells with the strange utensils provided. Overall, I had a really good birthday in Paris with my family and friends and got to do lot of amazing things.